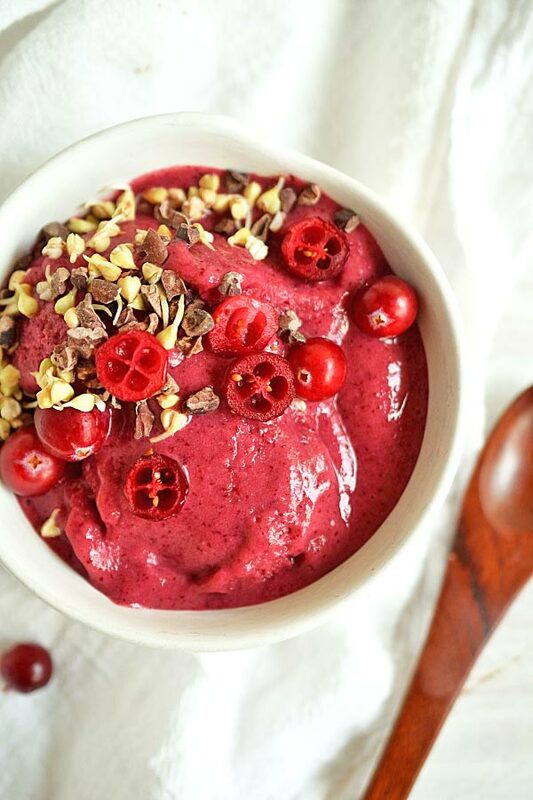 Friends, cranberry nice cream is now a thing. YES!! This combination is 100% meant to be. It’s a bold claim, but I think this will be the easiest, most delicious treat you’ll make this fall, regardless if it’s cold outside. I’ve always been a huge fan of fresh cranberries, as in I love to just eat them plain, and now that it’s fall I just can’t get enough of them. I think I’m throwing them in just about everything, which naturally led me toss them in my Vitamix with some frozen banana. Oooohhh man. I can’t even believe how good this is. It’s like… pink lemonade… but better! The banana offsets the tart cranberries perfectly, taking away that slightly bitterness of the cranberry and just leaving the tart pucker-up sort of deal. Aside from the flavor being incredible, this treat is so nutrient-dense! Cranberries are serious power-houses full of vitamins like vitamin C and E, minerals like manganese and copper, fiber (of course! ), antioxidants, and are low in sugar! The perfect addition to those ‘naners for a super healthy, beneficial treat. Plus, how easy could it get?? All you need to do is add the two fruits to your blender (I use a Vitamix) or food processor and whirl away until it’s creamy. I use about a 2:1 ratio of banana to cranberry, but if you’re hesitant on the tartness, start with less and then add based on what you like. If you love tart, dump. them. in. I love the combo of cranberries and chocolate, so I topped mine with Terrasoul Raw Cocao Nibs along with raw sprouted buckwheat and extra cranberries. 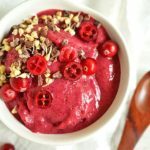 Place your bananas and cranberries in your blender or food processor. Again, I started with about a 2:1 ratio of banana to cranberry, which is a great starting place. Blend, using just a splash of water if needed to help blend, until smooth and super creamy! Taste. Do you want more cranberries for more tartness, or more bananas if it's too tart? Adjust and blend again. Eat right away or scoop into a pan and place in the freezer if you want it to be more firm. Top with your choice of toppings and enjoy! Love it! Nothing beats fresh seasonal cranberries! I always stock up and freeze them for the off seasons! Oh my goodness, I know! A must!